The Wotofo Serpent RDTA Tank is a single coil and flavor orientated platform that features a two post, shelf style terminal design and accepts leads up to 3mm wide. The coil sits directly above a large central airslot and is fed by dual wicking ports on each side, allowing horizontal coils to be fed quickly and efficiently. 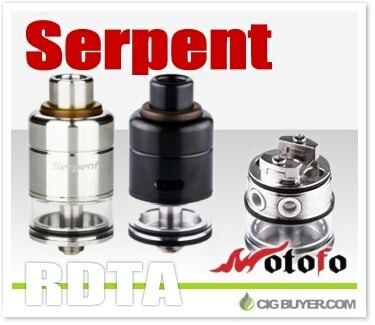 The Serpent RDTA offers 2.5ml of capacity and has a unique side-fill design with two grommet sealed fill holes, along with a single side adjustable air slot that directs airflow straight to the coil.